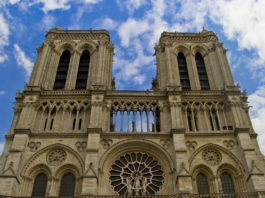 There’s nothing like Paris during the holidays. The Champs-Elysées is decked-out with lights, pastry chefs bring out the big (icing) guns to create the most beautiful holiday treats, and the shopping is unbeatable. And there is perhaps no more quintessential Parisian holiday shopping experience than Galeries Lafayette. The pop-ups, the celebrity chef collaborations, and of course their giant holiday tree in the middle of the coupole. This holiday season, Galeries Lafayette is giving Frenchly readers an exclusive reward for all that time spent finding the perfect presents: savings and a free gift. 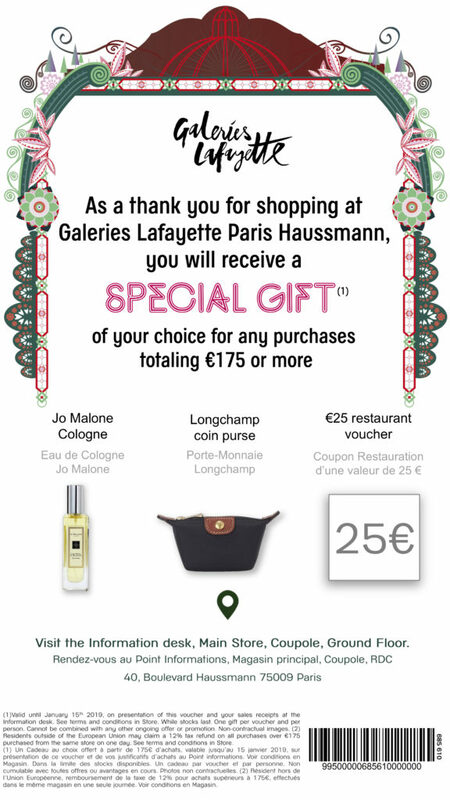 With this voucher, you can get a free Jo Malone perfume, a Longchamps coin purse, or a 25€ restaurant voucher when you spend 175€ or more. Just take the voucher and your receipt to the information desk on the second floor to get your free gift and file for your 12% tax refund on your purchases (i.e., get 12% of your money back!). 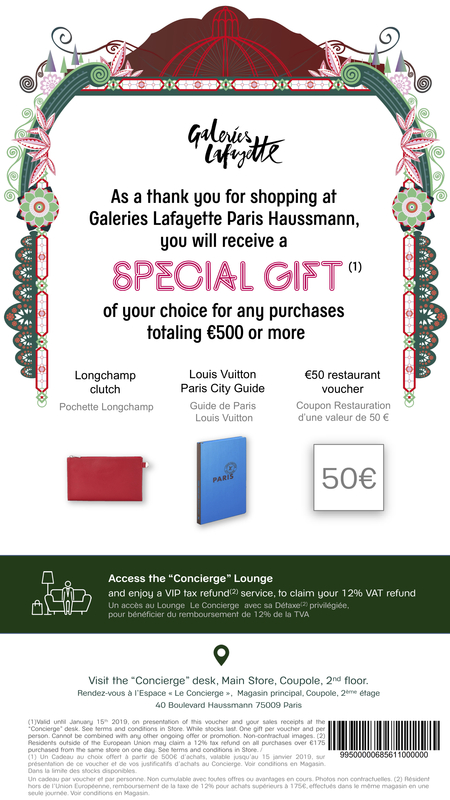 If you’ve got bigger purchases in mind and end up spending 500€ or more, use this voucher below to get a free Longchamp pouch, Louis Vuitton Paris City guide, or a 50€ restaurant voucher. In addition to the 12% tax refund, you’ll also get VIP service for your refund and access to the Concierge lounge. With brands ranging from haute-couture Chanel to the affordable Étam, plus books, Paris souvenirs, food items, home décor goods, and beauty products, spending 175€ at Galeries Lafayette happens in a snap, especially during the holiday season. 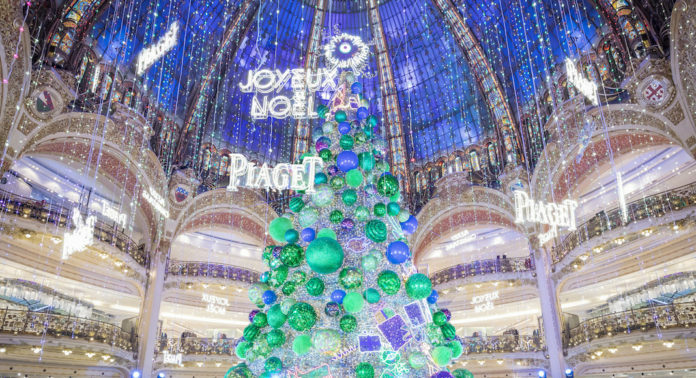 Needless to say, as a true Paris establishment, Galeries Lafayette doesn’t cut corners on the holiday celebrations. 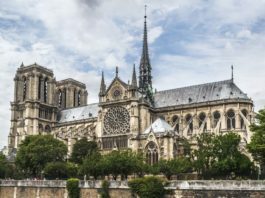 From the window displays to the interior decorations and the pastries you’ll snack on between purchases, no place in Paris is more festive. You’ll be in the holiday spirit from the moment you step out of the Chaussée d’Antin La Fayette metro stop. Eleven animated windows show scenes from the Dream Factory, where holiday wonders and magic take over. The animated scenes are — dare we say it? — even better than Saks Fifth Avenue’s in New York. Inside, under the stained glass of the coupole (dome), there’s a majestic, larger-than-life holiday tree. Decorated in an ever-changing theme, this year’s tree was inspired by the designs of children. Their drawings, brought to life with the help illustrator duo Marie Pommepuy and Sébastien Cosset, otherwise known as Keraskoët, are hidden among the branches and ornaments of the enormous tree. Pop-ups and collaborations are the name of the game and give you the opportunity to get some exclusive gifts for your favorite friends and family (and yourself). This season, jewelry house Maison Piaget has a pop-up with limited-edition baubles and bling, and designer Romain Costa has created a one-of-a-kind Scandinavian-style jumper for staying cozy during the coldest months. Famous chefs have lent their savoir-faire to the Grand Magasin’s Gourmet store to create holiday treats as beautiful as they are delicious. Choose the mini bûche de noel by Dalloyau, or get one of the whole yule logs by Pierre Hermé or Jean-Paul Hévin. Pick up a few of the other exclusive edible collaborations with Alain Ducasse, Thierry Meunier, Pierre Marcolni, or Yann Couvreur — they make perfect hostess gifts for a holiday party. In honor of “Fantastic Beasts and Where to Find Them,” Galeries Lafayette is bringing a different kind of magic into the store. In the men’s department, the magical world has taken over: entertainment areas, scenography, and magical items straight from Diagon Alley line the atrium. 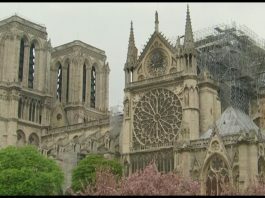 In fact, it’s France’s first space dedicated exclusively to Harry Potter. To best enjoy the shopping and holiday tidings, just print or take a screenshot of the 175€ voucher or the 500€ voucher above and present it to the Galeries Lafayette concierge. Note: Sponsored articles do not belong to the editorial team at Frenchly. They are provided or written at the request of the advertiser, who determines the content.